You may recall the campaign group Work Must Pay. 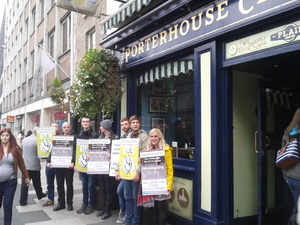 Its members have been protesting outside businesses which use JobBridge to hire staff. The group has ceased campaigning in Dublin…for now. Posted in Misc and tagged Campaign ends, Work Must Pay at 12:26 pm on November 19, 2015 by Broadsheet. Exploitation = coercion or fraud. If either of these conditions are absent, exploitation it ain’t . Don’t get me wrong, JobBridge is not being deployed in a wholly equitable way, to put it mildly. Capitalising on someone’s lack of choices is definitely exploitation. Fair enough: that’s in the ballpark of coercion. What are you basing this definition on? Gee, I dunno, a little life experience? I don’t claim to be any kind of oracle: we’re all allowed opinions here. I probably should have added a mild disclaimer in the original post. Hey Neilo you’re completely wrong. Try reading a dictionary. €50 for a week’s work is exploitation. Fair play folks, keep up the campaign!! I think the scheme is being abused, no doubt about that. The scheme was set up in such a way that it is in itself an abuse, in my opinion. Your definition of exploitation was a bit off point and it just seemed a bit unnecessary for you to take that approach. Hence I told you to “stop”, i.e. Stop digging. So, do force and deceit count as unfair treatment? Just admit that you were wrong. @Jungleman: no apology sought or required! I was being a bit of a plum. But doesn’t give a source. If you go to the Oxford English Dictionary (I’ll help you by giving you a link: http://www.oxforddictionaries.com/definition/english/exploitation ) it has the very same definition. Why put the effort into joining a debate that hinges on a definition if you won’t even check the definition? I’m genuinely confused as your argument is dead once somebody checks. Ah no, as I said above to moyest: if participants are forced into the scheme, I’d say that’s in the broad area of coercion. That’s unfair treatment to the letter and now, sure, it’s exploitation. Thanks! Why are you trying to retrospectively justify your definition. You came in here full of authority and bluster demeaning this group for their incorrect choice of word. You’ve been shown to be 100% wrong so just admit it. The thing fell apart because I used ‘or’ instead of ‘and’. Wrong, no doubt about it! No wonder I got leapt on. Jayzus. Must proofread before I post. That doesnt make any sense to me given the second sentence. You didn’t know what exploitation meant an hour ago. Now you do. Move on. If passing, why not stick your head in and say you have a message for the manager, that you are going next door/up the road for lunch because of the JobBridge advert. Just to let the management know how serious this is. What happened Reads on Nassau st. Went down this morning for some stuff and its now an Easons. No way am I paying Eason prices. Now thats exploitation. It was owned by Easons for a long time before they officially rebranded the shop. And the 10% off offer they had was bogus: they upped the conversion rate by 10% and then gave you 10% ‘off’. Always worth checking the conversion rate of shops that seem like they’re giving you a deadly offer. Another bookshop, on Parnell Street, which is all about the ‘savings’ has a mad conversion rate. Interestingly, once you take the money off, the price is about what the book should be. Easons are a nasty shower. Worked in the book trade for a long time and I have no respect for how they do business. They have an effective monopoly on bookshops in Ireland and they offer a substandard selection of books and have poor customer service. I could go on but it makes me ill ans I’d like to finish my lunch. The stores feel cheap and nasty and have the limited selection of an airport bookshop, but they charge premium prices. There’s loads of schemes that exploit people. I personally know someone working in a crèche, she does 37.5 hours and gets paid €215. The creche only contributes €75 of this. Yes the welfare are saving money by not paying the full amount of social welfare but to expect someone to work for that amount for a full week is outrageous. No argument from anyone with a fully-functioning brain. Or me. It is wrong, but I look at from the other side. 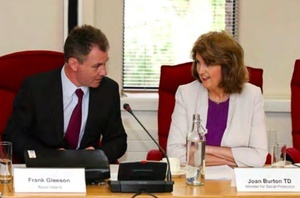 it’s not that we taxpayers save money on welfare, it’s that we taxpayers are subsidising the low pay of that company with the €75. Welfare payments are subsidies to companies who pay badly, more than they are payments to people on crappy wages. Have a look at how it has spiralled out of control in the USA. It’s easily googled. Well I’m gonna have to boycott the Porterhouse(S) now until this stops. Jobsbridge is undermining the entire services industry. Is this our ‘economic recovery’? I think it was dropped in September. I don’t think they should be bringing it up again if they have. Is there free pints of plain with the job. If so I’ll do it. In fact I’ll do it without the extra €50.